Mazda Motor Corporation today announced that its newly-developed SKYACTIV-G 1.3 engine has been named the 2012 “Technology of the Year” by the Automotive Researchers’ and Journalists Conference of Japan (RJC). The SKYACTIV-G 1.3 engine is available in the Mazda Demio for the Japanese market. RJC chairman, Hiroshi Fukunaga, announced the award after the final round of voting. The breakthrough SKYACTIV-G 1.3 achieves a record high compression ratio of 14.0:1 (For a regular gasoline mass production automobile engine, as of October 30, 2011) and exhibits outstanding efficiency, especially under high load at low rpm. 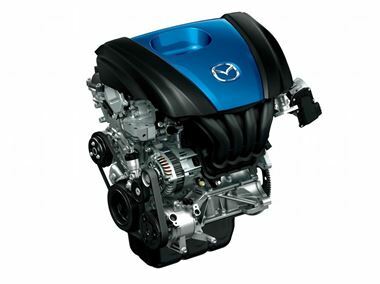 In order to avoid knocking – an unavoidable issue with conventional high-compression engines – the SKYACTIV-G 1.3 features a number of new technologies, such as special piston cavities that are designed to support ideal combustion, and special multi-hole injectors that enable precise fuel injection control. The first European vehicle to have a full slate of SKYACTIV Technologies will be the Mazda CX-5 set for launch early next year. This all-new compact crossover SUV will offer European benchmark reductions in both fuel consumption and emissions, combined with the exhilarating driving experience Mazda is known for.